Why should you delete all health information stored on a mobile device prior to discarding or reusing the device? By using software tools that thoroughly delete (or wipe) health information stored on a mobile device before discarding or reusing it, you can protect and secure the information from unauthorized access. How can you delete the health information stored on your mobile device prior to discarding or reusing it? 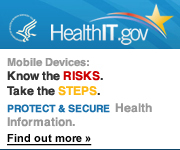 HHS OCR has issued guidance that discusses the proper steps to take to remove health information and other sensitive data stored on your mobile device before you dispose or reuse the device.